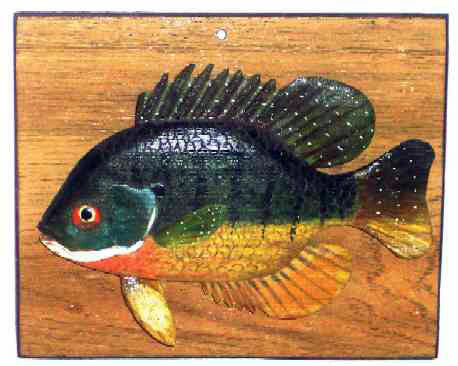 Presented here a charming little Folk Art Carving by Smoky Joe Jackson (1921-1994), Saginaw Michigan Chippewa Carver. He was a lifelong artist in wood and his works can be found at the Ziibiwing Cultural Society of the Saginaw Chippewa Indian Tribe and in numerous private collections. This particular carving, along with about 20 others were recently disbursed at auction and we are pleased to present it to you. It is in very fine condition, carved and painted with realistic precision and with a provenance through Michigan archer Floyd Eccleston where it most recently has been on display at the Chippewa Archery Shop in Mt. Pleasant, Michigan which is owned by the Hall of Fame Archer Eccleston. Smoky Joe knew his fish and birds and having viewed the collection I was impressed with the lifelike resemblance to the actual species which he carved. The sunfish is 8" long and mounted on a backboard, ready to hang.